Innerleithen is a large village located 7 miles (11 km) east of Peebles and 11 miles (18 km) west of Galashiels, in the old county of Peeblesshire at the confluence of the River Tweed and Leithen Water. Innerleithen was an important woollen, spinning and knitwear centre and is most famous for its medicinal spring, made famous in Sir Walter Scott's novel, St. Ronan's Well (1823), and refurbished in 1826 to cope with visitors. King Malcolm IV is thought to have given the church to the monks of Kelso in 1159 and to have included the right to sanctuary, allegedly in honour of a son who drowned in the river. Built in 1866 to replace the former parish church, Innerleithen Church represents an unusual design by the architect Frederick Pilkington (1832-98). 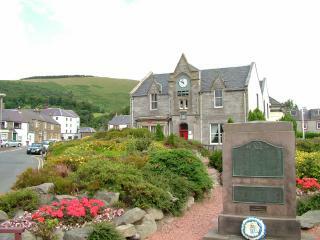 The Innerleithen Memorial Hall, built in 1922 to commemorate those who served in the First World War, lies next to the former Burgh Chambers, which was later occupied by a small museum. Robert Smail's Printing Works (founded 1837) are open to the public and now form the village's principal tourist attraction. Innerleithen holds the annual Border Games which began in 1827 and include the 'Cleikum Ceremony' in which St Ronan drives out the devil. Nearby stands Traquair House (11th Century), Scotland's oldest inhabited house, and Kailzie Gardens, while the Scottish Museum of Wool Textiles is located at nearby Walkerburn.